In South America, 450 kilometers from the Peruvian capital, the city of Lima, the plateau of the Nazca desert is located, which became widely known about eighty years ago. It is quite a deserted place, dominated by strong winds, which direction depends on the season. Plateau is considered to be one of the most arid places in the world. Rains fall two to three times a year. People have always avoided building dwellings in this area. However, this was true until the forties of the twentieth century. In 1939, Paul Kosok, an archaeologist from the United States, flew a light motor plane over the high mountains of Peru. From a height, he noticed an area of ​​about 500 square kilometers and several dozens of improbably smooth patches, located directly on the rocks. Kosok literally did not believe his eyes, the sites were exact copies of the runways of modern airfields. How did the ancient civilizations create twelve thousand lines to form about eight hundred drawings? Straight lines, very often parallel, not only pass over a more or less flat surface, but also descend into the hollows and go up to the top of the rock. Scientists date them from the beginning of our era. 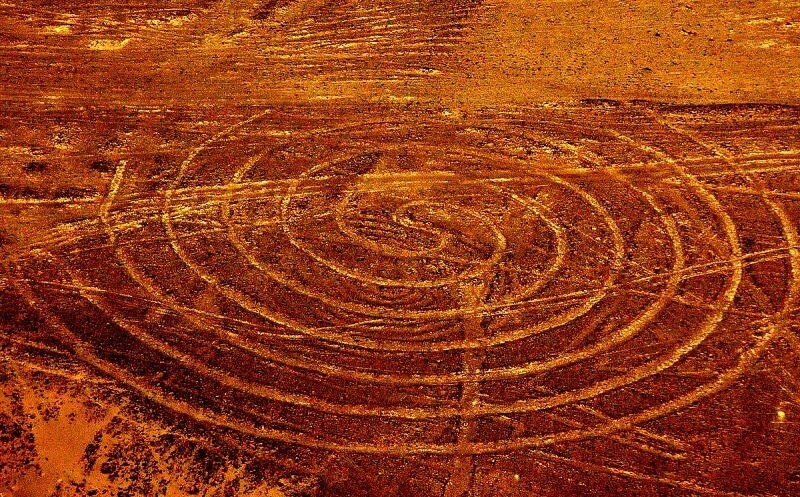 Perhaps this is the work of the Indians of the Nazca tribe. They lived in the territory of modern Peru even before the arrival of the Incas. Is it so? This hypothesis does not have sufficient arguments. Paul Kosok noticed that there are lines that point to large constellations, designate a change of seasons. Based on these facts, a version was expressed that images on the Nazca plateau are a huge calendar. There is a hypothesis that the images had a religious meaning and were used for some events or even solemn processions with torches. However, they could be used by one people, and built by another and much earlier. According to the numerous legends that the locals transmit from generation to generation, the drawings were made by the demigods. But we will repeat, these drawings can not be seen if you do not rise above the ground to a certain height. There is also an old legend about a ship made of gold, which flew from a distant star. In the exposition of the Colombian Museum of Del-Oro there is a so-called golden bird of the Incas. Designers from the United States, who visited this museum, noted its deltoid wing and vertical tail of the plain. This prompted scientists to carry out an experiment in the wind tunnel. Bird perfectly transferred supersonic speed. A couple of years ago, mysterious labyrinths were found near the plateau, their spirals twisting in opposite directions. Sometimes a bright beam of light falls on them. The source of the light was not discovered. By whom were these signals sent? The plateau sets increasingly difficult questions before the scientists without giving any hints.